We will be using Diane Fitzgerald's new book on dimensional shapes as a study guide. The book is entitled "Shaped Beadwork: Dimensional Jewelry with Peyote Stitch". We have copies for sale in the shop. We will probably stick with this topic for the next 12 months. Kits available for purchase from instructor – cost $45.00. Kits available for purchase from instructor – cost $110.00. There is a limit to 10 registrants per workshop. His workshops fill quickly. This is an all day class. The student will learn a few PMC (precious metal clay) techniques, make a pair of PMC (precious metal clay), earrings and while firing, will learn 2-3 other wire-wrapped earring designs. This entry was posted on February 28, 2009 at 8:53 pm	and is filed under bead weaving, beads, beadwork, jewelry design, jewelry making, Learn To Bead, Travel Opportunities, Workshops, Classes, Exhibits. 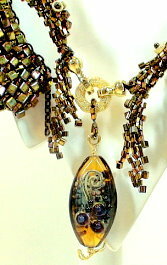 Tagged: bead weaving, beadwork, dimensional beadwork, jewelry design, learn study, shapes in beadwork, workshops. You can follow any responses to this entry through the RSS 2.0 feed. You can leave a response, or trackback from your own site.